Mark Lawrence: Bloggers: wind or windsock? Given that I've instigated a blog-off to find and give visibility to the best of self-published fantasy in which the grand prize is to be reviewed on 10 top fantasy book blogs it's probably worth considering how big a prize that is. Common-sense tells us that it's better to be reviewed on blogs than not to be. It's hard to sell a book that nobody is talking about. The question is: in general do blogs review books that are already being driven forward by word-of-mouth, that vast off-line network of one friend to another, conversations around the water-cooler or lunch table? Or do blogs initiate and drive forward that larger conversation? A gratuitous picture of a windsock. So - how do we know? I mean, obviously the answer is 'a bit of both' but which end of that spectrum is it? All I have to offer is anecdote, but it's anecdote coupled to some figures. I'm going by memory here, but I just clicked the first four links on the list and three of them featured Veil of the Deserters. Bloggers, at least the ones that seem to like my work, love Jeff Salyards. The blog-o-sphere as a whole seemed to catch RJB fever for the last quarter of 2014, and certain high-traffic parts of the blogging world literally ripped themselves asunder in their orgasmic rapture over Mirror Empire. So how did these books fare? I'm pretty damn convinced that the number of Goodreads ratings a book gets correlate to sales. If you want to compare two books, then if they are from the same year and same genre the relative number of Goodreads ratings is a half-decent indicator of their relative sales. For comparison a fair number of popular fantasy books released in 2014 have around 10,000 ratings. Kameron Hurley reported being pleased with her sales of Mirror Empire, 10,000 copies sold after 4 months is very good going. On the other hand we can see that all of that blog activity (and there was a LOT of it) didn't turn her into a best-seller overnight, or over 4 months. 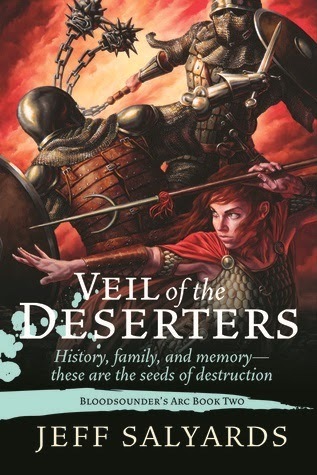 The real interest for me here is Veil of the Deserters. I've read and enjoyed the book and spoken with Jeff online quite a bit. He readily acknowledges that the book and its predecessor (also lauded on many blogs) have not sold spectacularly. One obvious reason that the books haven't sold in great numbers is that the publisher, Night Shade Books, collapsed during the release and had to be rescued by selling their titles to another publisher - in the meantime being unable to perform many of the fundamental tasks of a publisher, such as getting copies on shelves. Random people excited to be drinking water. This lack of visibility out in the real world obviously had an impact on those off-line word-of-mouth conversations so vital to selling books. We still had the on-line excitement over electronic copies supplied to blogs - but there was no corresponding drive in any of the other places where books get their boost from. This was a book that was really only seen by bloggers. Many of them loved it (as evidenced by its prominence in so many Best of 2014 list) and yet it seems to have sold only a fraction of the copies of some of its peers which got similar levels of love. The conclusion then? Well, there's no firm conclusion. But as a single observation, gifted to us by a the combination of blogger love and publisher fail. It seems to push us some of the way toward the windsock theory. A blog-gasm alone cannot assure great sales. An interesting take. I have often wondered how the author's sales correlate with the day after a blog post about their book goes viral. It is interesting to hear that there can be a disconnect even if the book has a strong online presence. A few years back, the last time I was in NYC, I met up with Anne Groell, GRRM's editor at Bantam Spectra, and I also had lunch with Betsy Wollheim and other folks from Daw Books. We talked about marketing and the online SFF community, and it appears that as far as they can tell the online community makes up for about 5% to 15% of the SFF market. Which is why many speculative fiction works receiving a whole lot of love around the blogosphere and SFF message boards don't necessarily sell a lot of copies. Saladin Ahmed's debut is a good example of that trend. Still, an author like Steven Erikson, who at one point mostly enjoyed an online cult following, later ended up on the bestseller lists on both sides of the Atlantic as word of mouth gradually grew and brought more asses in the seats. Hence, although it offers no promises of commercial success, having many SFF bloggers talking about and reviewing your book is never a bad thing! I've wondered something similar before. Most of the time I find the people who read and comment on my blog are other book reviewers, which means that in all likelihood, all I'm doing when I review a book is to recommend it to other people who are in the very same position I'm in. They may have already read it, or gotten a review copy, or what have you. Reviews on my blog probably don't correlate to a lot of sales for an authors. On the other hand, I've seen people report that the little kickback they get from Amazon each month is well over $50, and considering the small percentage affiliates get that way, that's quite a number of sales for a lot of authors. So clearly some people have better reach than others, and likely that reach extends beyond other bookbloggers. So reviews are great, but if all they do is generate other good reviews in turn, that may not mean a heck of a lot in the long run. Which is a shame, because there are a lot of books that deserve to do better than they are! Back when I was writing book reviews for newspapers, I got feedback quite often. At least a few times a week, I'd get an email or letter thanking me for turning someone on to a book or author, and yes, occasionally calling me an idiot for having a differing opinion from theirs. Since I left the newspaper business (one of the best moves I ever made) and have been reviewing solely on my blog, that feedback is much rarer. Part of it, definitely, is a numbers game. The traffic that I get to my blog doesn't even begin to scratch the surface of the number of potential eyes on my work when it was being published in print and distributed by a wire service. The biggest challenge for a blogger, though, is the sheer number of blogs out there. I've been running my site, in one form or another, since about 1997. It started as a website on the old AOL servers, and I eventually transferred it over to a blog because it was much easier to maintain. While I've managed, at times, to get a little traction with my music blog, my book blog has never really taken off, despite an 18-year history. It's hard to catch people's attention in a flooded market, and frankly, I probably don't read fast enough to have enough content to bring people back on a regular basis. But still, I occasionally get a note thanking me for turning someone on to a book or author, so I make some little impact, I guess. I won't push your book on to the best seller list for sure, but I may get a few people to give it a try. As to the question of how I choose what I read, these days it's the same way I always did before my stint as a "professional" reviewer. I read what I like. While I was with the newspaper, I was getting more review copies of books than I could ever possibly read. I felt pressured to review newer titles to justify getting more, so I'd set aside the few that appealed to me most by description and a quick sampling, and the rest would go into a box to be donated to a local charity book sale. It was often a snap decision, and I missed a lot of good books that way. When the newspaper chain I was working for began to lose interest in entertainment coverage, I made the decision with my blog to read what I wanted to read and not worry about it. Now I read new stuff, old stuff, and even revisit books that I've read before. I've always considered my reviews to be primarily just a way of sharing things I enjoy with others, and my blog is a truer reflection of that now. This question arises often in other blogger realms too, such as the wine & restaurant blogger review world. And they haven't any solid answers either. They know blogger reviews lead to increased sales, but that amount cannot be ascertained. One of the problems is that when someone purchases an item based on a blogger review, they usually don't tell anyone what led them to that purchase. If a person reads a book review and then goes to their local Barnes & Nobble to buy a copy, they don't tell the cashier why they chose that book. If they buy the book on Amazon, they don't submit a form to Amazon telling them why they bought the book. That purchaser may later write a review on Amazon, and might mention what led them to buy the book, but there is no guarantee. So, it becomes impossible to determine the actual influence of a book review. At best, we can rely on anecdotal evidence, on mentions from those people who state they were influenced by a review. I have bought books based on blogger reviews, though I don't keep stats on how many. It is also difficult to ascertain the chains of influence that a book review might possess. For example, say I buy a book based on a blogger's review. If I like it, I might post a review which could lead to more sales, but that might not have happened except for me having read the first review. Then, I might also tell my friends about the book, friends who don't read online reviews. And they might then buy the book, and tell their friends. So, that original book review had reverberations down a lengthy chain, yet tracking the effects of that chain are very difficult. The key is: book blogs lead to more sales. You can't quantify it, but you shouldn't ignore it either. I think you're right. There is an effect, but how big the effect of book blogs are...varies. I also think its a matter of who picks up on your book. Get Cory Doctorow or John Scalzi to like your book, and you really have a chance at a bump. No one gets a bump from my reviews.